JOSHUA DAVIS ON “THE VOICE” LIVE! Every once in a while something miraculous happens in my circle of friends. In this case it is more in my daughter May’s circle of friends, although I consider him my friend as well. Joshua Davis, lead singer and guitar player for many years with the roots-band “Steppin’ In It,” and often May Erlewine’s piano player is being featured on “The Voice” on NBC, Monday and Tuesday nights at 8 PM EDT. I had never watched The Voice before Josh was selected to appear on it; I don’t watch commercial (as in “commercials”) TV, but of course we had to see Josh! What a trip, watching Josh Davis being introduced to viewers and then going through the battle-rounds on his way up. So we were on pins & needles when country-star Blake Shelton dropped Josh in favor of another of his team’s artists, only to have Josh instantly snapped up (“stolen”) by well-known singer Adam Levine, another coach on The Voice. The upshot is that Davis made it through the battle rounds and will now appear for the live rounds in The Voice Tuesday April 7th, 2015, on an NBC affiliate near you. It starts at 8:00 PM EDT. In these live rounds we, the TV audience, get to vote by text, email, or iTunes, etc. on which performance we like. Of course, I will be voting. Hope some of you do too! Josh Davis is a wonderful singer (and an amazing guitar player) who lives with his wife Ann and two children in Traverse City, Michigan. He, along with my daughter May and my son-in-law Seth Bernard (and others) are part of the Earthwork Music Collective, a group of community-supported musicians that is perhaps unique in North America. What is remarkable IMO about Josh is that he sings with his wonderful gravelly voice, skipping the usual coloratura/high-range vocalizing that the other artists on the show display. Instead, he is singing straight folk music with heart. Aside from Josh, I believe there is one other folk artist in the whole crew, a young man named Sawyer Fredericks, who I hear is a big fan of my daughter May’s music. It is such a kick to have Davis reaching mainstream America through The Voice, and with roots music at that. I wish him the very best; he certainly deserves it. 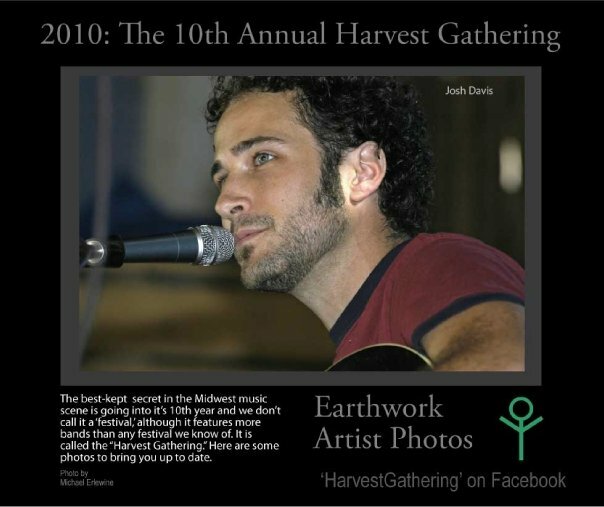 Here is a photo I took of Josh Davis some years ago during his appearance at the Harvest Gathering, a yearly gathering of hundreds of musicians near Lake City, Michigan. Our best wishes from Michigan!